Most of my sweetcorn failed to come to anything, they had no kernels of corn on them! My Mum gave me one of hers and so I made these fritters. They were very filling but delicious and went perfectly with the bacon and avocado. I also served it with a gorgeous tomato and onion salad. Put the egg, yogurt, cornflour, flour and salt and pepper in a bowl and whisk together until it becomes a smooth batter. Add the corn and spring onion and mix thoroughly. Heat a frying pan until it is fairly hot and add 1 tbsp oil. Drop ladlefuls of the mixture into the pan until you have 4 fritters. Cook for 2-3 mins or until the bottom is crisp and golden. Then turn over and cook the other side for 2-3 mins. You might need to do this in 2 batches. Add a little more oil if you need to, then add the bacon to the pan and cook for 1-2 mins on each side, until cooked through. 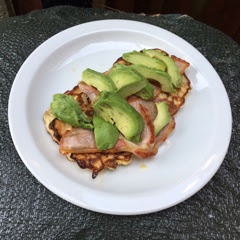 Serve 2 fritters on each plate, top with 2 slices of bacon and a few slices of avocado. Drizzle with the maple syrup.